LEEDS United continued their strong finish to a tumultous campaign with Tuesday night’s 2-1 victory against Championship visitors Wolverhampton Wanderers at Elland Road. On the day the club announced an innovative scheme concerning next term’s frozen season ticket prices, captain Bamba hammered home a 20-yard spectacular to give Leeds a 60th-minute lead which was doubled by Toumani Diagouraga four minutes later. George Saville then pulled a goal back for Wolves with 13 minutes remaining but Leeds had done enough to record a third straight victory that moved the Whites up to 11th. United will refund 25 per cent of all season ticket costs next season if the club fail to make at least the play-offs - or 50 per cent if the Whites sell more than 15,000. A gate of 17,694 witnessed Tuesday night’s end of season dead rubber, for which Whites head coach Steve Evans made three changes to the team that started against Reading with Lee Erwin handed a full debut up front in place of Mirco Antenucci. 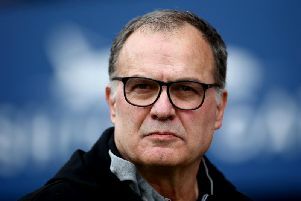 An unwell Stuart Dallas dropped to the bench as Lewie Coyle started on the right wing while club captain Bamba replaced Giuseppe Bellusci at centre-back. Wolves had the game’s first chance when Jeremy Helan’s lay off found an unmarked George Saville who fired just wide. Leeds then went even closer when Chris Wood jinked into the area at the other end before firing a low effort that hit the outside of the hand side of the post. But United then received a major let off five minutes later when Bjorn Sigurdarson’s cross found James Henry who had the goal gaping but could only bounce a volley wide. Leeds were living dangerously and a Henry shot then almost fell to David Edwards who would have had a tap in. But Wood was looking dangerous and lively for the hosts with the striker putting a 30 yard free-kick just wide before seeing his close range effort saved by Carl Ikeme after Lewis Cook’s cross. Wood then so nearly produced a superb individual opener when turning the Wolves defence and running to the edge of the area before putting a curling effort just over the bar. Erwin then showed good strength and control to bring down a long ball before firing just wide - the last effort of a goalless first half. Wolves immediately went close after the restart when Sigurdarson intercepted a Leeds break and honed in on goal before firing wide. Evans then opted to bring on birthday boy Stuart Dallas for Lewie Coyle and the winger almost made an immediate impression with his stinging volley deflected over. And it was from the subsequent corner that United took the lead from the most unlikely of sources as the ball was cleared to Bamba who produced a stunning strike from 20 yards into the top left corner. Then, just four minutes later United doubled their lead when a fluent attack ended with Lewis Cook squaring a perfect pass to Toumani Diagouraga who hammered the ball home from 12 yards. The double-salvo left Wolves flattened though Edwards should have pulled a goal back when scuffing wide from close range. But with 13 minutes remaining a Wolves counter attack ended with Saville slotting into the bottom left corner. Leeds immediately responded with Wood teeing up substitute Jordan Botaka whose measured effort hit the crossbar. United were then left indebted to a fantastic save from Marco Silvestri who got down low to deny Joe Mason an equaliser with eight minutes left. But United had done enough for a third consecutive victory that was almost capped by a goal for birthday boy Dallas who blazed just over with two minutes left. Leeds United: Silvestri, Berardi, Bamba, Cooper, Taylor, Coyle (Dallas 57), Diagouraga, Murphy (Bridcutt 81), Cook, Erwin (Botaka 74), Wood. Subs not used: Peacock-Farrell, Bellusci, Phillips, Antenucci. Wolves: Ikeme; Iorfa, Batth, Hause, Doherty; Price, Saville, Edwards; Henry, Helan (Le Fondre 55), Sigurdarson (Mason 73). Subs not used: Martinez, Deslandes, Coady, Enobakhare, Hunte.